Symbol mattress is one of the leading mattress producers; it was established over 50 years ago in Richmond, Virginia. The leading mattress producing company was put in place in 1961 as Easter Sleep Product with an aim of producing value driven and cheap products to their clients. Presently the company produces a variety of bedding products with a range from premium to promotional retail prices and has a broad base of comfort products. Additionally, the company has expanded its range of products to include hospitality, healthcare, dormitory and rent to town sleep products among others. Symbol mattress operates its factories within six states the factories have a wide area of more than one million square feets of real estate, which is exclusively dedicated to the mattress production and distribution of excellence sleeping products. The company is committed to superiority by involving the best available expertise. All their plants are characterized with sate of the art technology and equipments which include, automated upholstery machines and whole line of urethane foam processing equipment. The company can process components within the plant rather than outsourcing from other places, and this allows them to maintain higher control over the products cost and quality. This advantage is always reflected with their consistent production of valueble and quality products to customers. Rather than settling for a low grade mattress thinking that it is what you can afford, check out for Symbol mattress. The company has made it a reality for people to afford durable mattresses, which allows them to enjoy their sleep. The company mattresses have features that every consumer normally checks before buying their mattress. They have a wide product range, from durable to high luxury mattresses, from memory foam to spring coil mattresses, from premium to grand value mattresses. With this assortment of products, there is something for every person and the price of these products can fit into all financial plans. 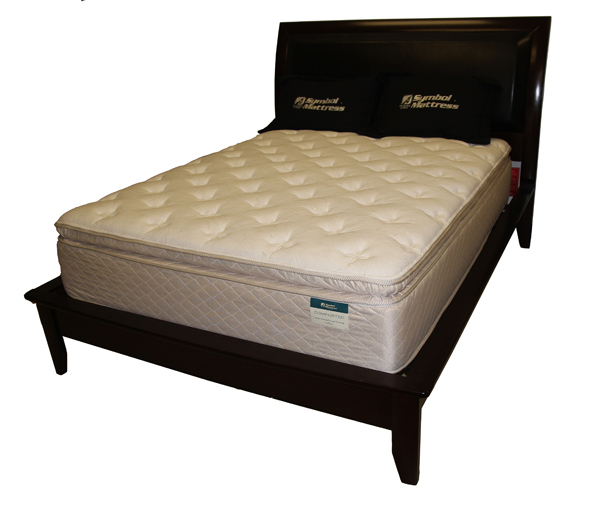 Symbol Mattress is dedicated to providing their employees with a favorable working environment. The safe and stable work environment has been a motivation to the workers. This has urged them to dedicate their services to producing quality, valuable and comfortable products to the wider range of customers. More than 50% of Smbol company workers have worked for the company for more than ten years, while 30% of the work force have worked for Symbol Mattress for 15 years and above. Symbol Mattress company is committed to providing employees with a good working environment that promotes their safety andfamily values. Through offering a stable and safe work environment, the work force have embraced this atmosphere with a dedicated attitude to our mission statement that of providing value, comfort and quality to our customers. The company has a large number of trucks which they use to offer less expensive delivery of their products to customers. For children, the company has a wide range of products like toddler beds, convertible cribs, bunk beds, futon and much more. Symbol mattress products are sold entirely through a channel of approved symbol mattress retailers. I have only had this bed for about 2 weeks so I hope this is as bad as it will get. It took a few days for my body to adjust to the firm memory foam but once it did I was able to get up out of bed the next morning with little to no back pain, unlike the previous bed.